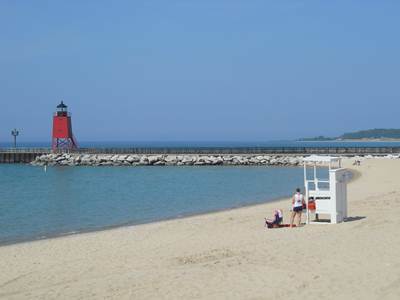 Charlevoix also has four city beaches, two each on Lake Michigan and Lake Charlevoix. Depot Beach on Lake Charlevoix has warmer waters than Lake Michigan and you will often see swimmers heading out into the lake in late May. Ferry Beach, also on Lake Charlevoix, has a gently sloping sandy swimming area is a popular beach for parents and their children. Ferry Beach offers lifeguards so swimmers love it. Michigan Beach on Lake Michigan is often a popular early morning or late evening spot for lake laps. Lifeguards are on duty during the day during the summer. Mount McSauba also on Lake Michigan has a wide sandy swimming area. Lake Charlevoix's warmer waters can mean a longer swimming season. Swimming in Boyne City is so special that the community hosts a swimming camp. The non profit organization that operates the camps teaches dozens and dozens of children how to swim each summer.